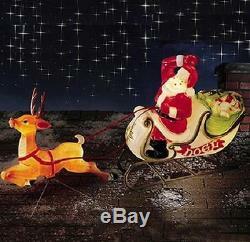 6' SANTA REINDEER SLEIGH LIGHTED BLOW MOLD DISPLAY Outdoor Christmas Decor NEW. Put our Christmas blow molded Santa/Sleigh & Reindeer decoration outside your home, roof or lawn to show him how much you appreciate the gift of Christmas spirit. Size: Sleigh: 36"L x 39"H x 13"W, Reindeer: 34"L x 19"H combined approximately 72"L.
Santa is sure to appreciate seeing this giant replica of himself on his yearly mission of joy. Santa is illuminated with a 25w bulb (not included). Reindeer is illuminated with a C7 bulb (included). Made of durable blow molded plastic. Reindeer's antlers in nighttime picture appear darker and are better represented in non-background picture. NOTE TO GLOBAL CUSTOMERS: THIS ITEM IS MADE ELECTRICALLY FOR USE IN THE USA AND HAS AN AMERICAN PLUG - IF USED IN ANOTHER COUNTRY, IT MAY REQUIRE THE CUSTOMER TO USE A VOLTAGE CONVERTOR AND/OR A PLUG ADAPTOR. IF THIS ITEM IS PLUGGED IN WITHOUT THE PROPER CONVERTOR, THE DECORATION MAY BE RUINED OR WILL REQUIRE REPAIR. We are flexible as long as we hear from you! Heavyweight items may sometimes require additional time. We understand that sometimes circumstances change - and we will try to work with you! Feedback is very important to us. Please be prepared to provide photos of damages. We are a small company run by a husband and wife team!! We love home decor, and enjoy offering great deals to you on wonderful items for your home!! We hope you enjoy your shopping experience!! Customer service is very important to us! We try to respond to all questions as quickly as we can! The item "SALE 6' SANTA REINDEER SLEIGH LIGHTED BLOW MOLD DISPLAY Outdoor Christmas Decor" is in sale since Tuesday, November 15, 2016. This item is in the category "Collectibles\Holiday & Seasonal\Christmas\ Current (1991-Now)\Yard Décor". The seller is "homeimprovements2012" and is located in Minneapolis, Minnesota. This item can be shipped to United States.